Doctors To Pregnant Women: Wait At Least 39 Weeks A full-term pregnancy lasts 40 weeks, but some women are now electing to deliver two or three weeks early. Even though 37 weeks is still considered full term, studies show that babies born even a few weeks too early are at greater risk for health problems than those who are born later. Science and medicine, as they relate to pregnancy and childbirth. Part of the "Beginnings" series. A rendering of a 36-week fetus in the womb. In her living room, Caroline Nagy introduces the newest member of her family — the 6-week-old infant in a striped onesie cradled in her arms. "This is Alex Joseph. He was born May 24th — my birthday," she says. Their shared birthday wasn't entirely a coincidence. Two weeks before her due date, Nagy was swollen, and uncomfortable. So she asked her doctor for relief. "I was just miserable. It was like uncomfortable to walk; I couldn't sit on the floor and play; I felt like I was neglecting my first kid because I just couldn't move and I couldn't do anything," says Nagy. "So I asked, 'Is there any way I can speed this up and have a baby earlier?' "
For Jackie McGinty, it wasn't discomfort but timing that caused her to schedule her daughter's birth by C-section eight years ago. McGinty's first child was delivered by C-section for medical reasons, and although this time around she had hoped to deliver naturally, she had just moved out of state and wanted her family nearby to help with the baby. "My mom was coming out and she was only going to come out for a few weeks. I needed her to be there after the birth. ... So having the option to schedule it was good for us," says McGinty. 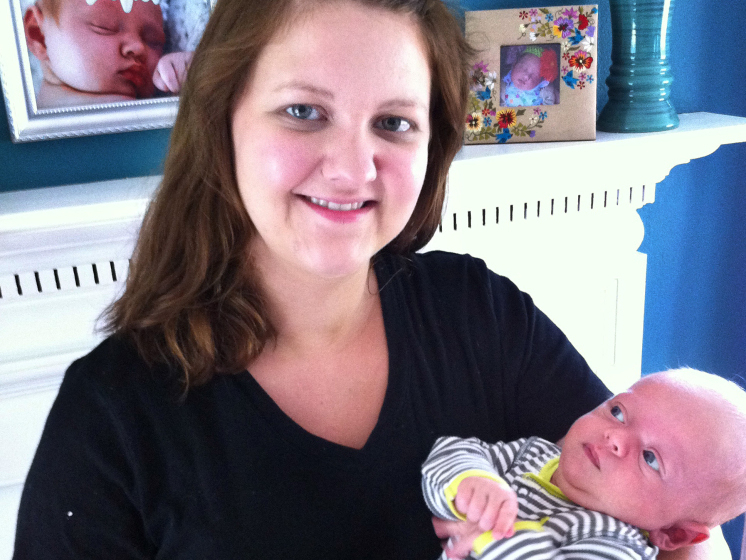 Caroline Nagy and her now 8-week-old infant in Youngstown, Ohio. Nagy says she had labor induced early at 39 weeks because she was uncomfortable and felt as though she was neglecting her other child. The increase wasn't because of emergencies, says Jay Iams, a specialist in maternal fetal medicine at Ohio State University, but rather because women and doctors began scheduling deliveries for convenience — "convenience for the mother, for the family, for the physician," says Iams. Sometimes, Iams says, it's because patients say to themselves, " 'I want only my doctor to be there. I don't want the person who's on call.' "
Pediatrician Ed Donovan of Cincinnati Children's Hospital says data collected over the past several decades show those babies have an increased risk of complications compared with waiting until the mother goes into labor spontaneously. "It's now really well-documented in national studies that the risk of the baby having to require intensive care in a neonatal intensive care unit — even the risk of infant death — is increased when the baby is born as little as two weeks before the due date," says Donovan. The reasons for this are two-fold. First, without an ultrasound measurement in the first trimester, a woman's due date could be as much as two weeks off, making the fetus 35 weeks instead of 37. And second, Donovan says the brain, heart, lungs, and immune system all mature at different rates — and some may need a little more time than others. "Just because the lungs are mature doesn't mean that the other organ systems are mature," says Donovan. 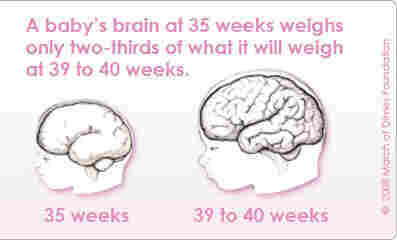 "A baby born three weeks early with mature lungs may not be ready to eat because the brain's not fully developed." According to Donovan, doctors realized they simply weren't very good at determining which babies were ready and which weren't. And Iams says the large numbers of sick babies made many doctors begin to think differently about early deliveries. "Thirty-seven weeks is term, but they became the most common occupants of neonatal intensive care nurseries," says Iams. "And the pediatricians naturally said, 'They could have waited.' "
Still, many women and even many obstetricians remained unaware of the risks because it didn't fit with their experience. "People see their friends having babies early, and sometimes women go into labor on their own at 37, 38 weeks — and that's not unusual and those babies are fine," says Jennifer Bailit, an obstetrician at Metro Health Medical Center in Cleveland. "But those are babies that have told us that they're coming and that they're ready." "It's tough to be pregnant, and sometimes when you're in the moment it's hard to keep the big picture in mind," Bailit says. "When we guide people toward that kind of thinking it really helps them say, 'I'm doing this for my baby; it's worth it.' "
And the idea is catching on across the country. The March of Dimes has taken what began in Ohio and a few other select states and extended it nationwide in a campaign it's calling "Healthy Babies are Worth the Wait." Alan Fleischman of the March of Dimes says the rate of elective births in the hospitals the organization has surveyed is about 30 percent. "Most hospital leaders don't believe they have this problem until they actually measure it," says Fleischman. "And when they do, they're surprised."